Nanni Moretta, Giulia Lazzarini and Margherita Buy in "Mia Madre." Photo from "Mia Madre" Facebook page. “MIA Madre” is a film that can be difficult and uncomfortable to watch because it is so close to the lives of many. Once we reach a certain age we are beset by life’s vicissitudes: financial reverses, divorce, illness. Dying and death. Moviegoers looking for escape will not find it in the latest film from Italian director Nanni Moretti.“Mia Madre” (“My Mother”) has its U.S. premiere at the 53rd New York Film Festival today. Autobiographical, “Mia Madre” revolves around director Margherita (Margherita Buy). Her beloved mother is dying. She is in the middle of making a film with American actor Barry Huggins (John Turturro providing comic relief) who is likable but high-maintenance. And her daughter is neglecting her Latin. Sound familiar? Like so many of us, Margherita must buck up and manager the turmoil in both her personal and professional life. Falling apart is not an option. NM’s mother became ill and died while he was making “We Have a Pope,” he said through an interpreter during a press conference after the press and industry screening of “Mia Madre.” Though he did not elaborate on why he chose a woman to play the director instead of playing the director himself, he admitted to a kinship with Margherita. In a departure, NM cast himself not in the lead, but in a supporting role. Giovanni is the brother of Margherita. 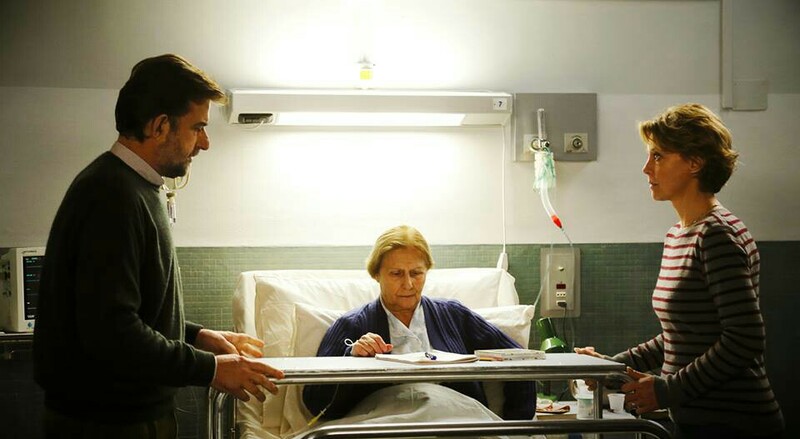 In another departure, Giovanni assumes the role of lead caretaker of their mother (Giulia Lazzarini). It is he who spends the most time with her, dealing with medical personnel and meeting what needs of hers he can. He keeps Margherita abreast of developments. It is Giovanni who takes a leave of absence from his job to be there for his mother. It is the man in this situation who has the cooler head in this situation. Conversely, Margherita is walking a tight rope and brings the audience with her. At any moment she is going to snap. Will it be when she arrives to find her mother’s hospital bed empty? Or when jokester Barry forgets his lines for the umpteenth time on a difficult shoot? A meltdown is imminent. MB delivers a taut, controlled performance as a woman under siege and it shows in the often haggard appearance of her character. “Mia Madre” is an engaging drama about difficult circumstances but manages to avoid the melodrama that would surely plummet it to the level of a pedestrian soap opera. It is also all-too real.